I love decorating the house for autumn. I had fun putting together some silk flower arrangements for a splash of colour and the table runner is made from some retro fabric ( I think it hales from the 70's originally - check out the fabric on the binding and backing especially...) I received years ago. It took me a long time to figure out what I would use those fabrics for, but I am happy with the autumn table runner that they became. Wow Katherine!! They all look so great! You definitely have a lot of talet girl!! absolutely beautiful! i just love the colours of autumn. thanks for the inspiration! Wow! very pretty! Love that runner! I always love how your house is decorated to enjoy the changing seasons! 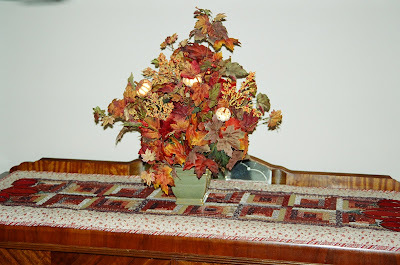 And with fall having my favourite colours, I guess I love your table runner too! Hi Katherine, great to have you commenting on my blog. I shall look in at yours, I admit I am useless at sewing and knitting but I love anything to make the home 'homely' and I love garden articles too. Love that table runner. Welcome fall! I've had fun poking around yours, too. 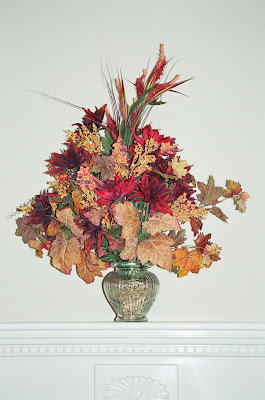 I love your fall arrangement and runner. Really pretty!!! Hi Katherine! Thanks for joining me on the October fabric abstinence...what have we got ourselves into?! Hope none of our fave fabric shops goes on sale. LOL! I love the way you've put together the colours on your table runner, especially the applique pumpkins. Very pretty!